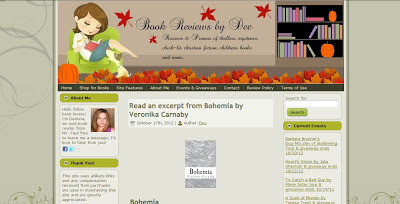 Read a brief excerpt from Bohemia published in Book Reviews by Dee, along with some background information on the novel and author Veronika Carnaby. "I took to the heart of the town by foot, passing by the shingled buildings, wooden cross bridges, and soggy, leaf-adorned porches of New England. I just loved experiencing the newness, tasting a wacky flavor, bursting with the spirit of suburbia, indulging in the evening sunsets, blooming pine trees, and piles of dried-up grass, something which just wasn’t readily disposable in the city. I made my way down Main Street, the area of Nashua that pulsated with small town energy more than anywhere else." Visit Book Reviews by Dee to read the entire excerpt.